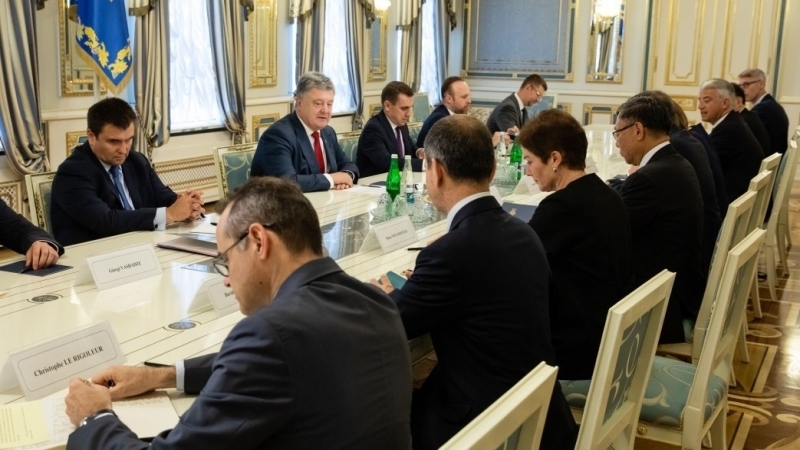 June 15, President of Ukraine Petro Poroshenko met with the ambassadors of the G-7 and the European Union countries, the press service of the head of state reported. During the meeting, the parties discussed the results of the recent meeting of the G-7 leaders in Canada. Poroshenko thanked the international club for supporting Ukraine. Particular attention during the meeting was devoted to the issue of Ukrainian political prisoners in Russia. The President of Ukraine noted the importance of international support in this matter. Furthermore, Poroshenko announced the entry into force of the law on the Anti-corruption Court. Reportedly, the G7 countries intend to hold the Russian Federation accountable for the aggression in Ukraine.